World Youth silver medalist Khalifa St. Fort was the lone athlete with Florida ties to make the Final on day three of the 2016 IAAF World U20 Championships while a loaded semifinal heat knocked out Jamal Walton, and former Colonial jumper and FSU freshman Armani Wallace concluded his international experience after making the finals. 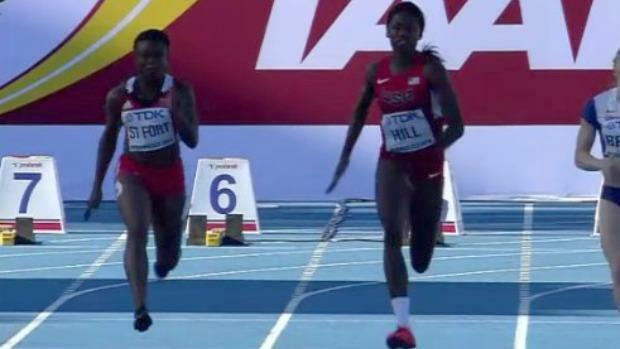 Khalifa St. Fort looked for revenge against teen pro rival Candace Hill in the 100m semifinals and finals on Wednesday. 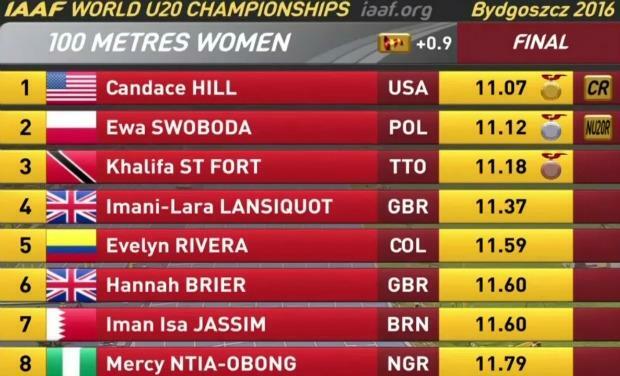 St. Fort finished runner-up behind Hill at IAAF World Youth Championships in 2015. In heat one of the semifinals Hill edged her out by one-tenth of a second 11.12 to 11.22 for the first and third fastest times of the day. In the finals, it was all Hill. The youngster from Georgia shined in all facets of her technique and broke the championship for the second time in the day with a speedy 11.07s. Poland's Ewa Swoboda wooed the hometown faithful with a silver medal showing and new Polish junior record of 11.12s. St. Fort was third in 11.18 to earn the bronze medal. Her time was one one-hundredth faster than she ran at the IAAF World Youth Championships in 2015 (11.19), and just two one-hundredths shy of her PR of 11.16 set at the Trinidad & Tobago Olympic Trials where she was fourth. Rising junior Jamal Walton, also from South Florida advanced to the semifinals in the men's 400m dash, but ran into a LOADED field. Karabo Sibanda of Botswana posted the fastest time of the day with his 45.15. Four of the six finalists came from this race. Unfortunately for Walton, he was the fifth best in the race (46.61), and wasn't able to advance and improve on his 4th place showing at the 2015 IAAF World Youth Championships. Armani Wallace, a Colonial High School graduate, and FSU freshman qualified for the finals in the triple jump after leaping 16.04m on Wednesday, the third best in his flight, and fifth best overall. Wallace's wasn't able to pull out those kind of numbers in the finals, only jumped 15.10m for 12th place, nearly two meters behind champion Lazaro Martinez of Cuba who posted World U20 leading mark of 17.06m.